At the low-lying confluence of the River Avon and Severn, Tewkesbury is a Medieval half-timbered town. Presiding over this quaint streetscape is the Romanesque crossing tower of Tewkesbury Abbey, which has held on to a wealth of other Norman details. In 1471 Tewkesbury was the site of a battle that put a new king on the throne and killed an heir apparent. Remarkably the battlefield has been left undeveloped and hosts the largest Medieval reenactment in Europe every July. Many of the half-timbered houses on Tewkesbury’s streets can be visited as museums, while the empty Severn Ham meadow has a view of the town without a single modern building in sight. During the Dissolution of the Monasteries this rich former Benedictine Abbey church was saved from destruction when the people of Tewkesbury claimed it as their parish church. 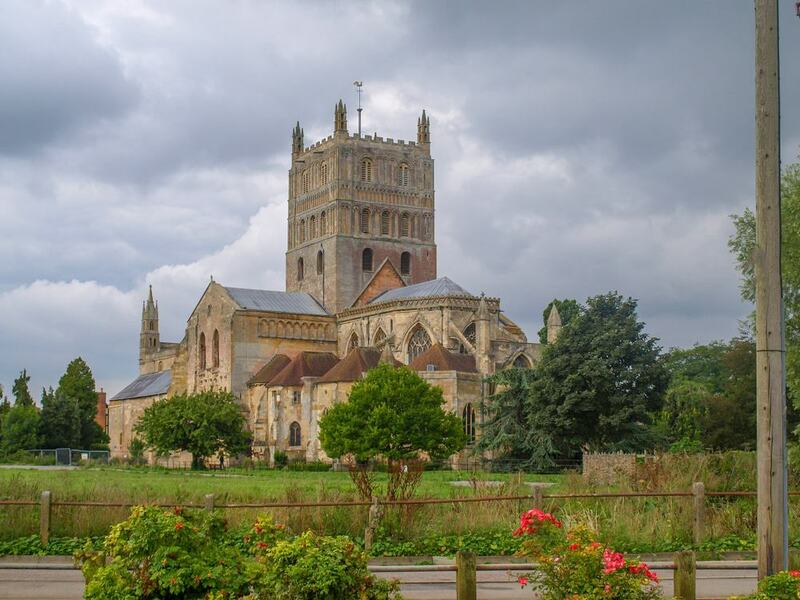 And we can thank them for that, because Tewkesbury Abbey has some of the country’s best preserved Norman architecture. This can be seen in the crossing tower, which is probably the largest Romanesque structure of its kind in Europe, as well as the eight bays of the nave, supported by giant pillars. Outside, the tall Romanesque circular archivolts on the southwest face are unique in the UK. The Decorated Gothic chancel retains most of its Medieval stained glass, and on the floor in the centre of the sanctuary is a brass plate marking the grave of Edward of Westminster, Prince of Wales (son of Henry VI). He was killed at the Battle of Tewkesbury aged just 17, and remains the only Prince of Wales (heir apparent) to have died in battle. Just next to Tewkesbury Abbey are the Abbey Cottages, a row of lovely half-timbered houses dating to the 1410s. The museum inside was founded in the 1980s in memory of the local naturalist and author John Moore, celebrated for his writing on the countryside. In that spirit of conservation the museum has specimens of the mammals and birds native to Gloucestershire’s farmland, woodland and wetlands. Children can find out what badger fur or hedgehog prickles feel like, and see how moles’ smooth fur helps them squeeze through tunnels. 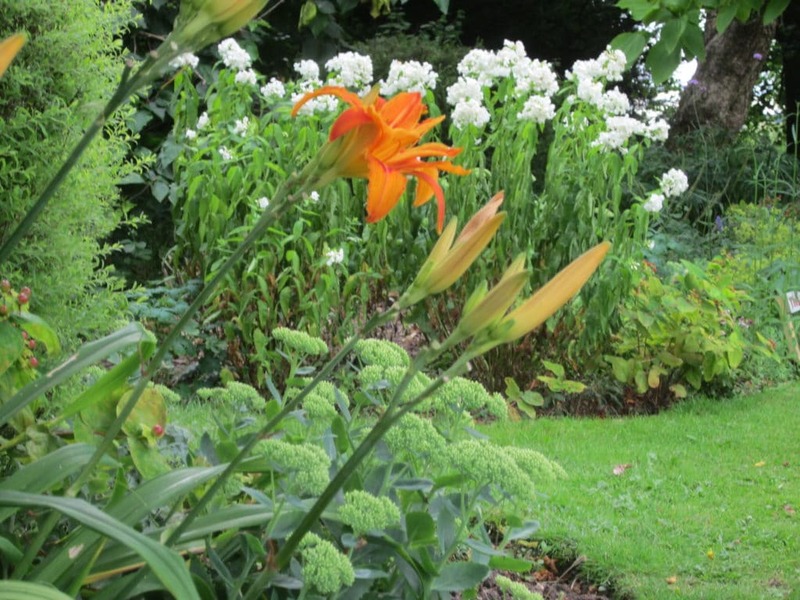 There’s also a small collection of agricultural tools, and a cosy cottage garden, planted with traditional species. A few doors along Church Street is another building in the care of the John Moore Museum. This stunning half-timbered house has been restored and furnished as it would have been in the 15th century. The front door opens onto a merchant’s shop, and this leads to a hall with an open fireplace and stairs that wind up to the bedroom with four poster bed. At the back is a typical Medieval kitchen showing off some of the utensils and ingredients used in home cooking at the time. The staff are in Tudor attire and answer any queries you might have about 15th-century home life in Tewkesbury. 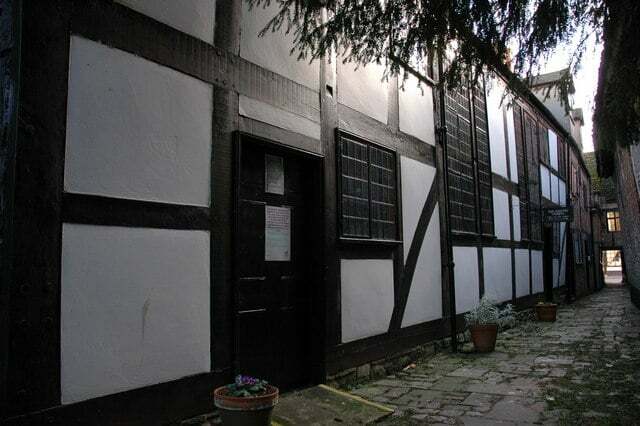 Just off Church Street, and also in the care of the John Moore Museum is an extraordinary timber-framed building that began its life as a simple residential property. But around the 17th century it was converted into a Nonconformist meeting house, initially in secret. In the 1970s the Old Baptist Chapel and Court restored to how it would have looked in 1720, when the vaulted ceiling, gallery pastor’s room and baptistery were all added. This exceptional building has just been given a facelift and new interpretation signs have been fitted. In the 17th-century cemetery behind is a grave for William Shakespeare-Hart a descendant of the famous playwright. In one of the UK’s best heritage townscapes it pays to plan ahead if you want to see everything. You can download labelled maps of the town or pick up a leaflet from the Tewkesbury Heritage and Visitor Centre. At the junction of Church Street and the High Street is the stunning 15th-century Cross House, thought to have been the court house of the Lords of Tewkesbury. The Olde Black Bear on the High Street dates to 1308 and may be the oldest pub in Gloucestershire, though is currently closed. 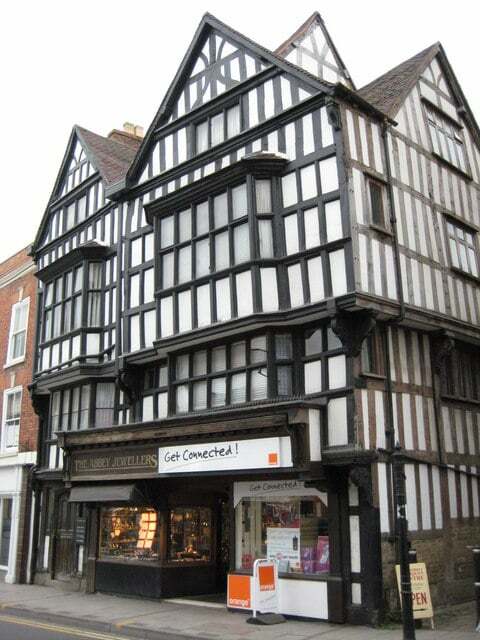 Also on the High Street is the precariously cantilevered 16th-century Golden Key House, the top floor of which was added in 1610 and leans over the street. This is all just a small introduction, as the Abbey Mill, Town Hall (1788), Ancient Grudge (1471), Tudor House Hotel (c. 16th cent.) and The Old Wheatsheaf Inn (1500) all warrant a look. One of the decisive battles in the Wars of the Roses was fought in fields south of Tewkesbury on May 4, 1471. The result was a Yorkist victory, ensuring 12 years of stability until the death of Edward IV in 1483. The thrilling thing about Tewkesbury Battlefield is that it sits in the town’s back garden and remains mostly untouched, while the battle was recorded in detail at the time. A waymarked trail takes to the key sites, and you can pick up a Battle Trail leaflet from the tourist information centre. 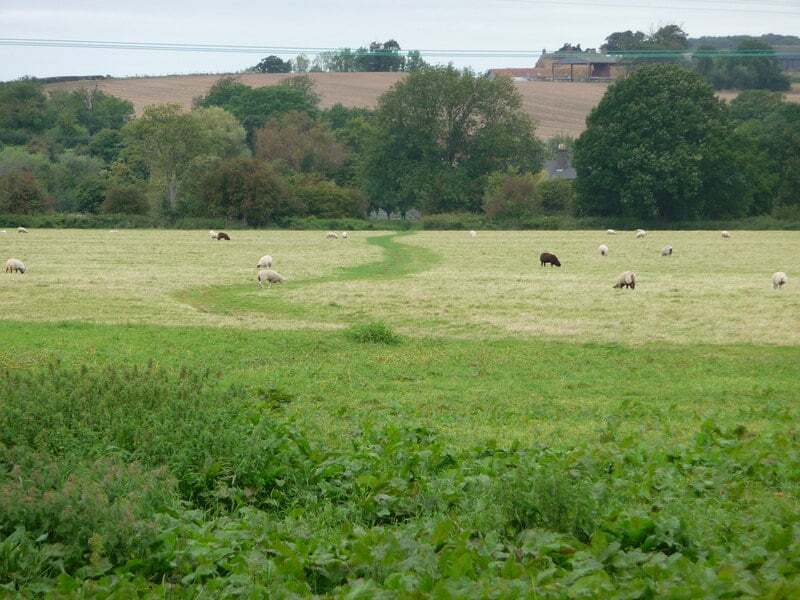 The Bloody Meadow beside the Coinbrook is the scene of the gruesome final rout of the Lancastrian Army as they tried to escape across the Severn. For the full inside story you can join the Tewkesbury Battlefield Society for its monthly guided walk. 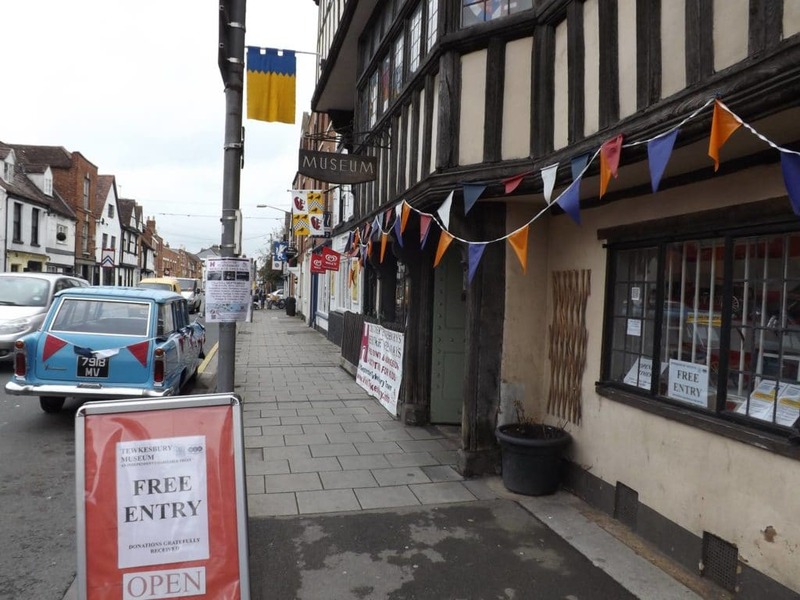 In a handsome half-timbered house, the Heritage Centre is the place to go to for local history and facts about Tewkesbury’s rich architectural heritage. You’ll go on a whirlwind trip through time, learning about the area’s earliest human inhabitants but also getting know the complicated background to the Wars of the Roses and English Civil War. You’ll be handed a media player when you enter, and will be led around by Mr Bartholomew Read, a 17th-century resident. Kids will get to try on helmets and armour, while you can have a go at embossing a Medieval coat of arms and play a game of Medieval top trumps. Another 17th-century house is the evocative setting for the town museum, which is as eclectic as they come and investigates many aspects of Tewkesbury’s past. You can get to know the polar explorer Raymond Priestley, one of the few survivors of Captain Scott’s Terra Nova Expedition (1910-1913). Added to that is a diorama of the Battle of Tewkesbury made in 1871 to mark its 500th anniversary, and a masterful scale model of a fairground scene, put together over five years in the 1950s to celebrate the town’s market heritage. Also on show are the maquettes made for the early designs of the Arrivall sculpture, which we’ll cover below. 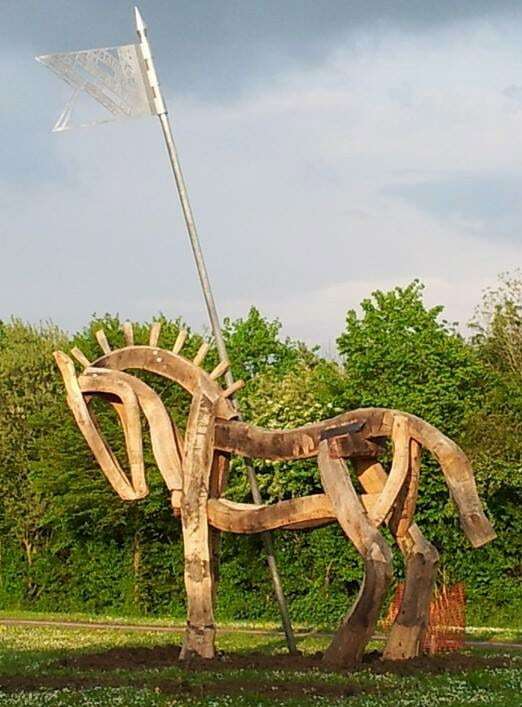 Coming into Tewkesbury on the A38 you’ll be met by a pair of commemorative sculptures erected in 2012 at the Stonehill roundabout. On each side of the road there’s a timber horse. One is mounted, representing the victorious Yorkist army, and the other is riderless and symbolises the vanquished Lancastrian forces led by Henry VI, who died (or was most likely murdered) at the Tower of London two weeks after the battle. The sculpture is on the high ground where Edward IV’s army first came into view on the morning of May 4. The horses stand eight metres high and their steel pennants were cut using high-pressure water jets and sport designs by local schoolchildren. These figures are full of symbolism, down to the choice of green oak timber, standing for Tewkesbury’s many timber-framed houses. Doubling as a stage theatre and a cinema, the Roses presents more than 5,000 movies and live performances a year. This modernist building from the 1970s was transformed in 2015 with a new facade and a coffee shop. The main auditorium seats 375 and along with local choirs and theatre productions, books touring dance companies, plays, musicians, comedians and cultural figures for talks. 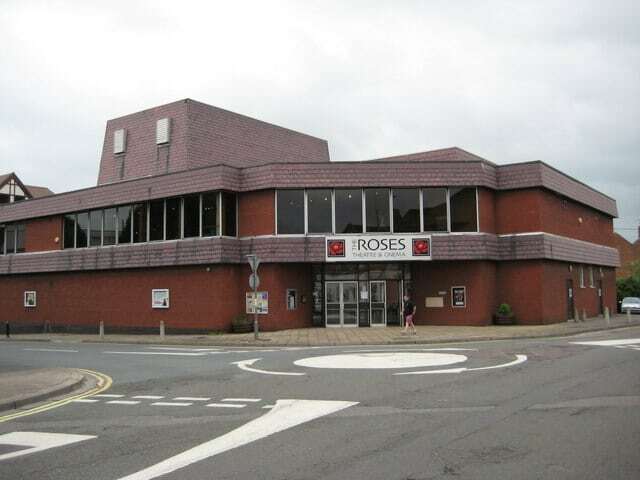 The Roses theatre is also deeply involved in the community, organising some 5,000 theatre and dance classes for local children and teenagers every year. The cinema screens live screenings from West End theatres and the Metropolitan Opera, as well as new independent films. As a footnote, the much loved Eric Morecambe gave his final performance at the Roses in May 1984, before collapsing from a heart attack just after the curtain came down. Next to the abbey on the bank of the Avon is a park laid out for Queen Victoria’s diamond jubilee in 1897. There’s a pergola, decorative urns, flowerbeds and a set of three iron arches erected in 2012 to celebrate the diamond jubilee of another queen, Elizabeth II. The layout is mostly Victorian, although the bandstand, railings and a commemorative cannon were all removed for scrap in the Second World War. At the riverside you can contemplate the Abbey Mill just upriver and established in 1795. To the north and west is the open expanse of the Severn Ham meadows, behind which rise the Malvern Hills, made up of some of the most ancient rocks in England. You can cross over to this large island between the Severn and Avon in the summer. Things are trickier in the winter because the meadow is flooded for months on end. Out here, you’ll feel like you’re escaping to unbounded countryside, only a few hundred metres from the centre of town. There’s also a photogenic view back to the Romanesque tower of the Abbey, with the Abbey Mill and a signature terrace of half-timbered houses in the foreground. In summer there’s sprinkle of colour created by wildflowers like lady’s smock and meadow buttercup, all flourishing in the Severn’s alluvium. When this article was written in 2018 this natural space to the southeast of the town had only recently been created. 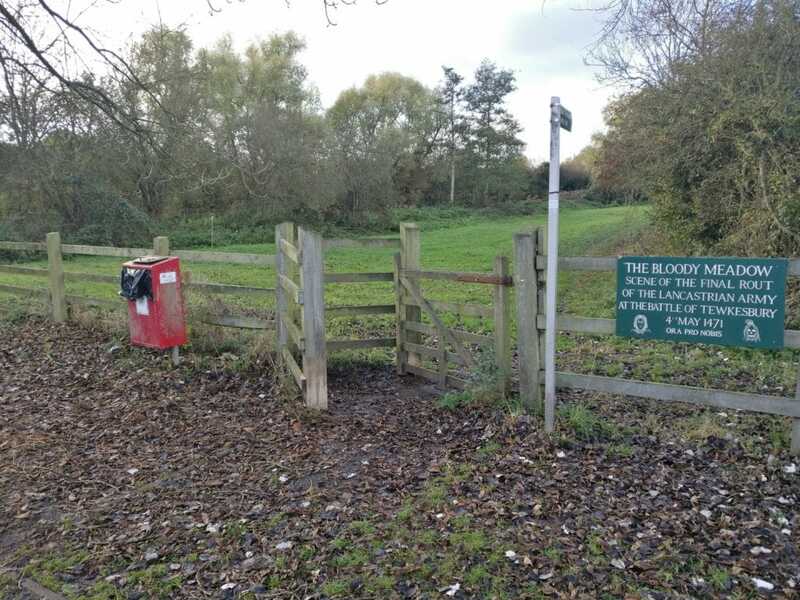 The reserve is on the floodplain of the River Swilgate, and is being improved to provide a haven for wildlife a stone’s throw from the town centre. Already 68 bird species have been recorded at the site, and more will surely follow when the wetland habitat takes shape. As part of the project, new meanders have been excavated to allow reedbeds to take hold, and eventually these will be home to otters and reed warblers. 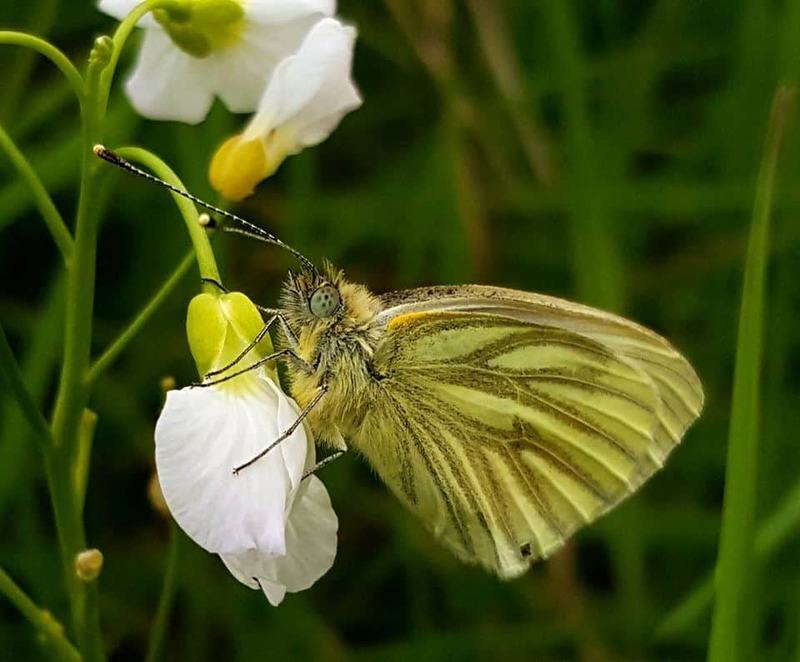 In the meantime you can pay a visit to see the progress and read the signs to find out about species that have already made their home here. On the site of an old gravel and sand quarry a mile north of Tewkesbury there’s a lake with a holiday community on its shores. 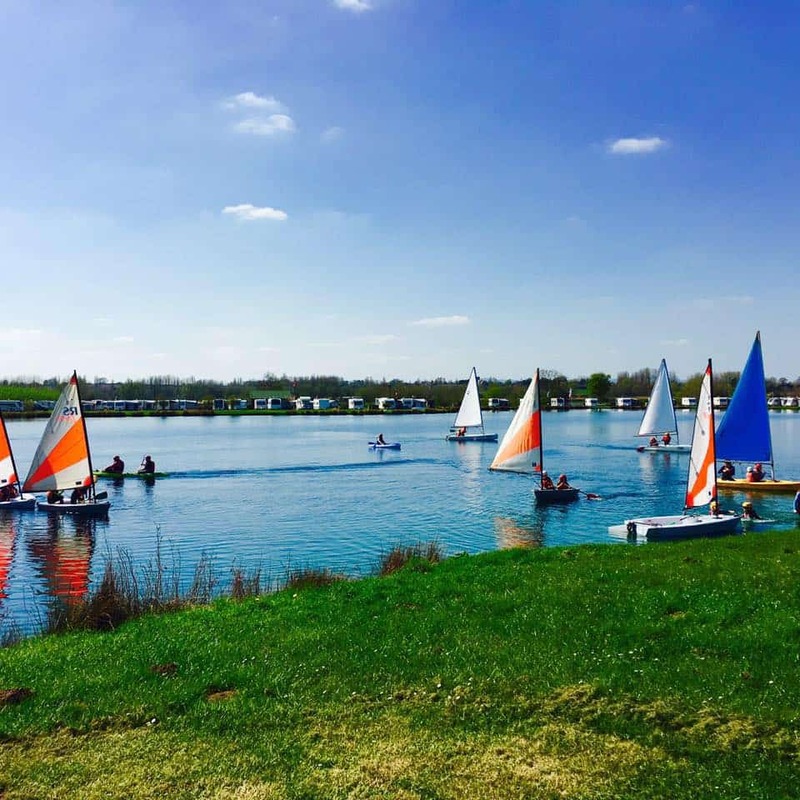 You don’t have to be a resident to make use of the Royal Yachting Association-accredited water sports centre, which hires out equipment and offers tuition for a menu of activities like stand-up paddleboarding, canoeing and kayaking, windsurfing and sailing. If you’re new to any of these activities you can book a short “taster” course, to learn basic skills, safety and theory. 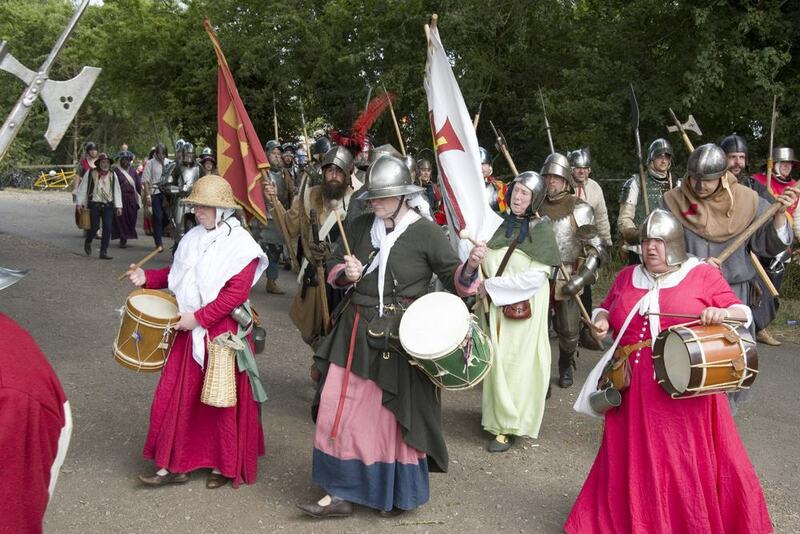 The main event of the summer season in Tewkesbury is the largest Medieval reenactment in Europe. In mid-July this two-day recreation of the Battle of Tewkesbury takes place at the very spot where it was fought in 1471. Thousands of people take part in the battle, fighting in a haze of gunpowder, armed with pikes, swords and bows. But there’s much more going on, like a historically accurate Medieval camp, where many of the participants and their families spend two whole days living in the 15th century. Entertainment is provided by jugglers, jesters, dancers and musicians, while the Medieval Market sells old-time cookware, clothing, accessories, games and musical instruments. Ales and cider flow in the Beer Tent, while there are period games and arts and crafts for youngsters at the children’s activity tent.